Redux Books guarantees 100% customer satisfaction. If, for any reason, you are not satisfied with your order, let us know and we will do what we can to replace the item you are not happy with, issue a refund or offer store credit. Can we obtain books we don't have in our inventory? Yes. We have the ability to locate rare or very specific books that people would normally not have. We very much enjoy tracking down books for people that they are having a hard time finding. Contact Us for more information. At the moment we are not hiring, but that does not mean that we won't ever be hiring. Keep checking back for more updates on our hiring status, or get a hold of us for more information. Yes. 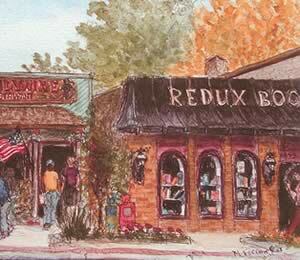 Parking for Redux Books is located directly in the rear of the store. There are two alleys that access our parking. One is located just to the East of the store (on Lake Drive) and the other is on Carlton Street just north of The Dominos Pizza located on the corner of Carlton and Lake Drive. What if we haven't answered your question? Even though this FAQ list is quite exhaustive, we still understand that we can't come up with every question that might be asked of us so please, feel free to contact us with any questions you might have. Looking For Our Online Inventory? Copyright © 2007 Redux Books. All Rights Reserved.